Abundance of Galls and Lack of Acorns: Are They Connected? 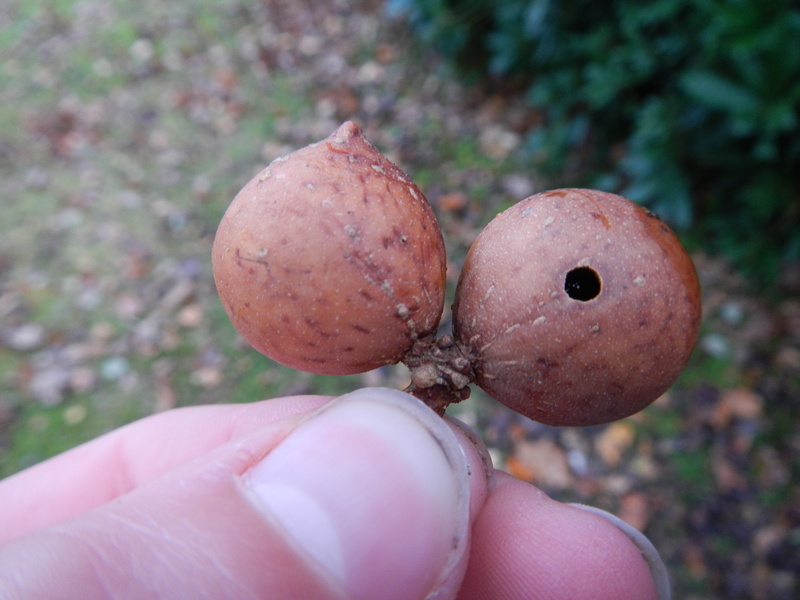 This post is mainly to inform you about a debate I have been having with a few people on ispotnature.org about whether the distinct lack of acorns this year is connected to the increase in galls, especially Oak galls and to share some facts on the most common Oak galls. 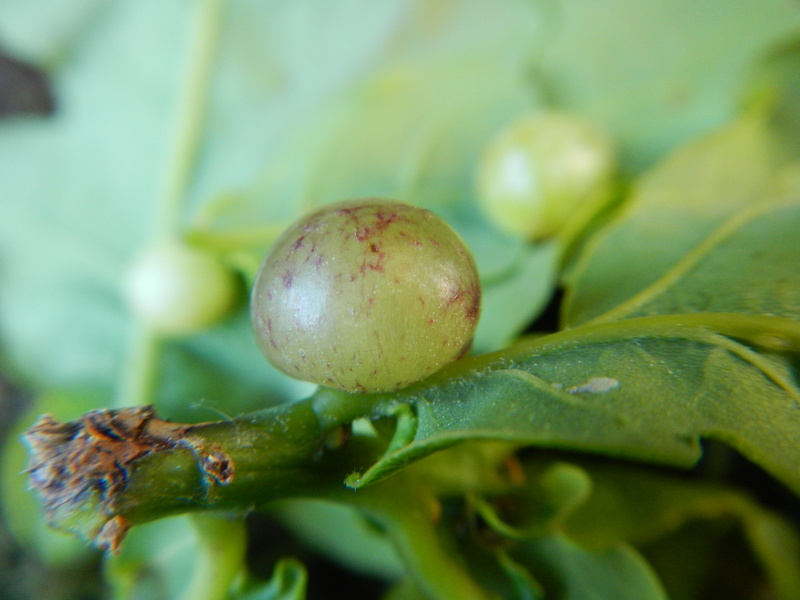 Galls are made by an insect called a gall wasp. There are many different species of gall wasps and so a wide variety of shapes and sizes in the galls, from the ‘fluffiness’ of the Robin’s Pincushion Gall to the smoothness of the Oak marble gall. 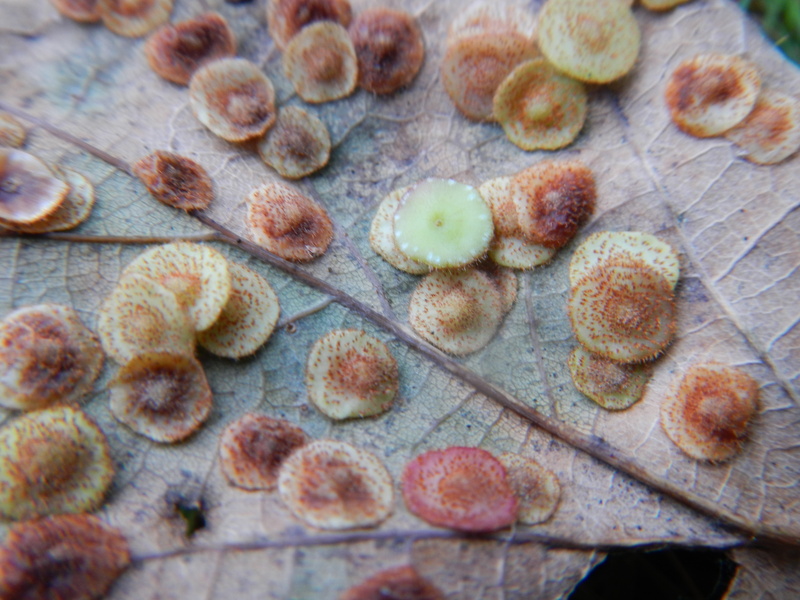 The purpose of the galls is to create their own microhabitat, in which the insect larva can develop (relatively) safe from predators and feed off the interior of the gall. Surely you have noticed the lack of acorns in Britain this year compared to the abundance last autumn? 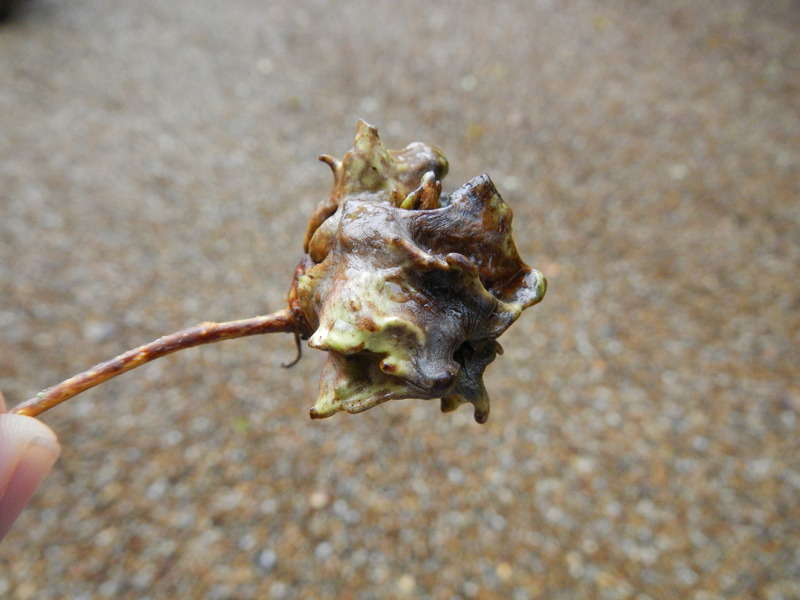 Well we are debating whether the abundance of Oak galls is connected to the lack of acorns this year in one of iSpot’s forums. Here is the link to the debate so far: http://www.ispotnature.org/node/440563 (I’m jimmymac2). A reason why there may be an abundance of galls this year is because of mild weather. We had a very mild winter last year, it didn’t snow at all where we live and the gall wasps will survive better in warmer conditions. This might affect the amount of acorns because there is a species of gall called the Knopper Gall (Andricus quercuscalicis) that is made on (and completely covers) acorns. However, I haven’t seen that many Knopper Galls compared to the Oak Marble Gall (Andricus kollari) which grows on the twigs of the oak and therefore doesn’t affect the acorns at all. You can see an exit hole on the one on the right hand side. The cynipid (gall) wasp has two distinct generations forming two distinct types of gall: The Common Spangle Gall is a disc-shaped gall found on the bottom of Oak leaves in early autumn. They are creamy-yellow with brown specks and there can be up to a hundred on each leaf, only one larva in each. They fall to the ground in autumn and there they continue to develop through the winter and they finally emerge as adults in April. These adults are the Currant Gall generation and the galls they make are smooth and round, green at first but then maturing to red, like a redcurrant. The next generation emerges in June from the Currant Galls and they create the familiar Common Spangle Gall so continuing the cycle. The smooth green one in the centre has just been turned over. Found on an Oak leaf I was using to cover my Longworth Trap! This one is mature, hence the brown, woody appearance. So far it seems that the abundance of galls and the lack of acorns is not connected, though if they were it would probably be down to the Knopper Gall, which completely envelopes the acorn it is on. I hope to gather more information in the future, so any comments will be greatly appreciated! There has actually been quite a lot of wildlife news to report on, which is why I am writing another Ardingly Wildlife Report. Term started early September and a great way to start (wildlife-wise) is to check up on the breeding Little Grebes on the pond near the Pre-Prep! It turns out that they are alive and well And feeding as they should, along with some Coots and Moorhens. Keeping on a bird note, the afternoon of Friday 10th October was improved by the sight of a pair of Common Buzzards circling above 9 Acre and a Grey Heron perched on a dead tree nearby that gave me quite a shock by acting like a Night Heron! It was also good to see that a number of House Martins (and to a lesser extent, Swallows) flying about the main building, hunting the last of the summer insects, but gradually there have been fewer and fewer. One morning I noticed a number of birds around and above the Terrace, including the first couple of Cormorants moving to inland waters like the reservoir. Also Starlings, various Hirundines, Black-Headed and Herring Gulls, Jackdaws, Magpies and Wood pigeons. Also, I couldn’t do this without mentioning the abundance of Pied Wagtails on the Green and the Hard! Moving on from birds, I would be interested to know if any of you have noticed circular black spots on Sycamores, called Sycamore Tar-spot (Rhytisma acerinum). This is a fungus, and they are actually a good sign, showing that there isn’t much air pollution in the area! 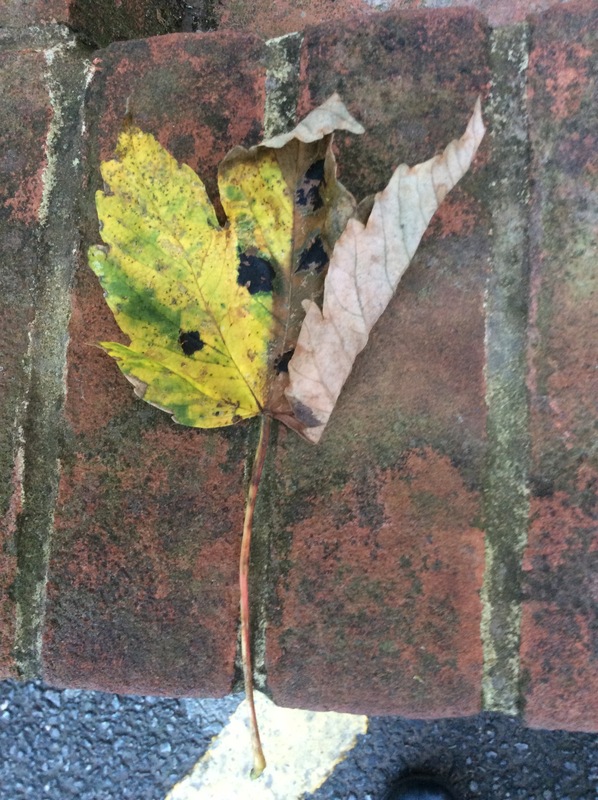 I have found them mostly near the East Quad changing rooms and the wood and the car park nearby. I am also sure most people from Ardingly reading this will have seen at least one green furry caterpillar with red horn on one end, which I have identified as a Pale Tussock (Calliteara pudibunda). I think they have the red horn on their rear end to take the attention of a predator away from the head end and the bright colours are an easy way to tell that it won’t be a good idea to eat it! All in all, a great start to the term!